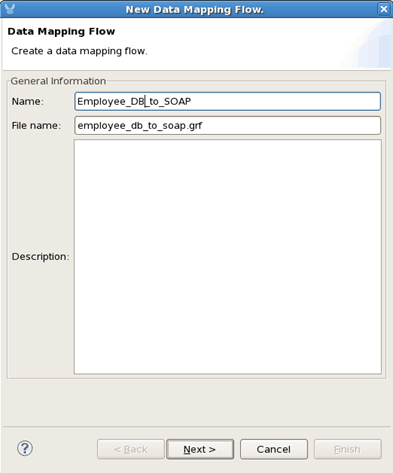 Part 2: Service enabling the Oracle HR database with SOAP and XML. Now let’s turn the HTTP/JSON service we created in Part 1 into a SOAP web service by using a top-down approach of generating services from an existing WSDL. 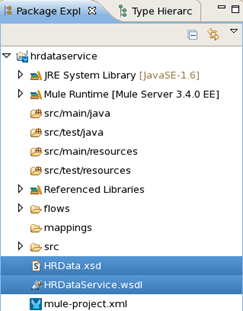 Download the files HRData.xsd and HRDataService.wsdl and place them in the root folder of your hrdataservice project. 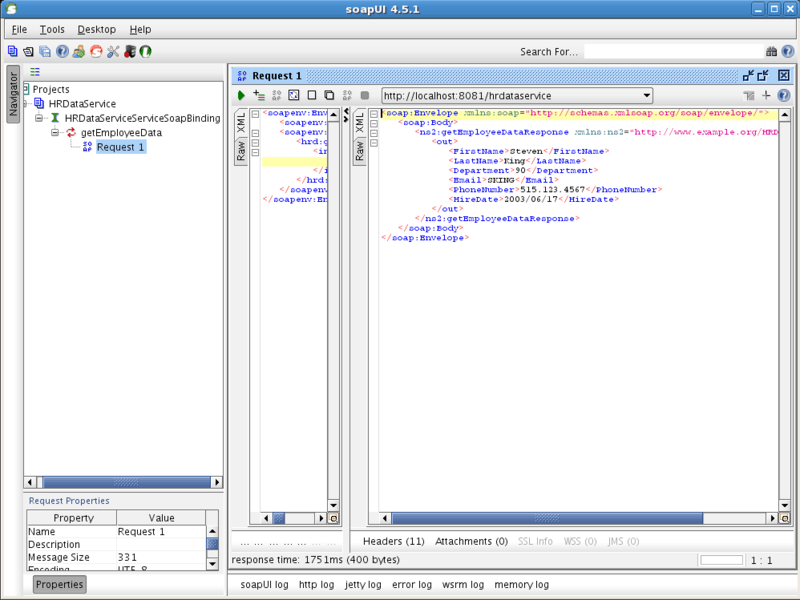 Back in the message flow, add a SOAP component right after the HTTP End Point. 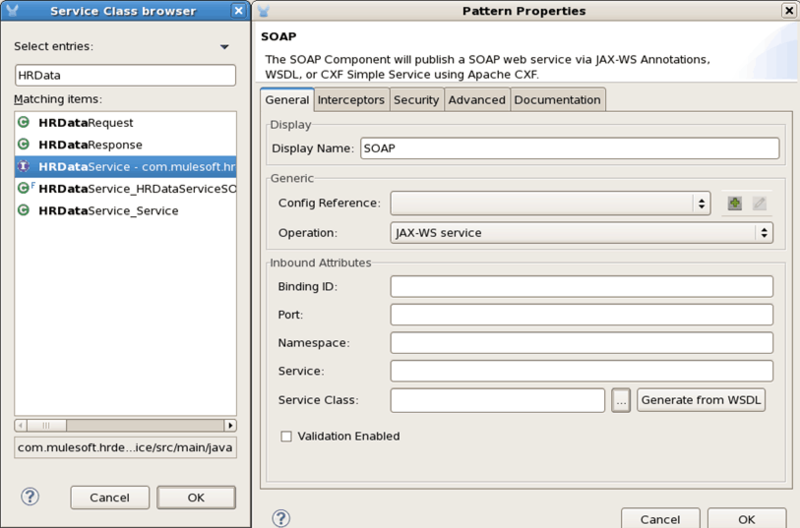 Double-click the SOAP Component and click Generate from WSDL. 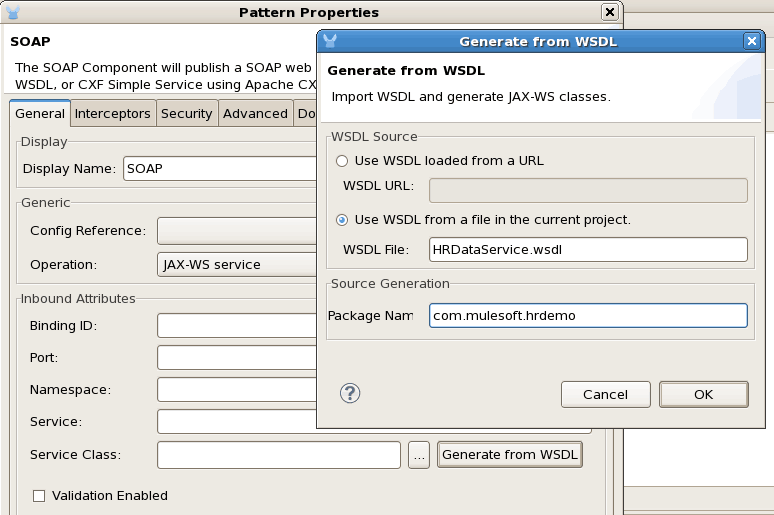 Specify the WSDL File HRDataService.wsdl and a package name of com.mulesoft.hrdemo. 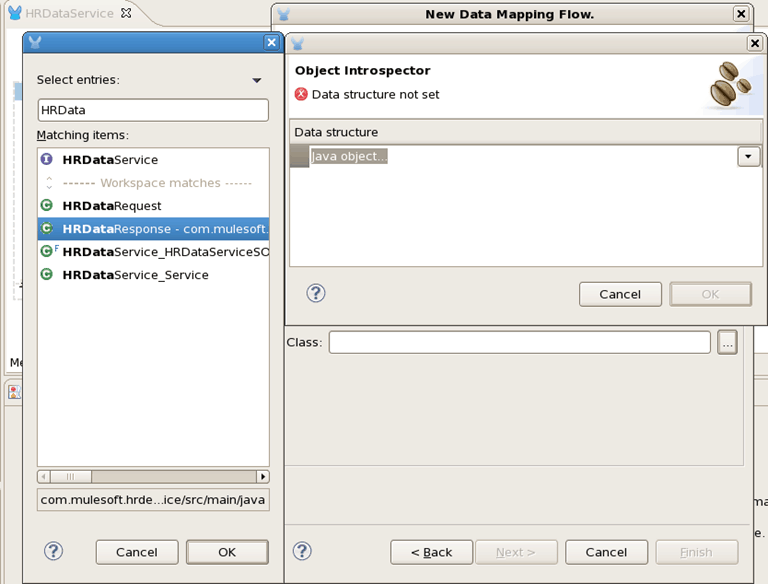 This will generate the Java classes required for your web service implementation. 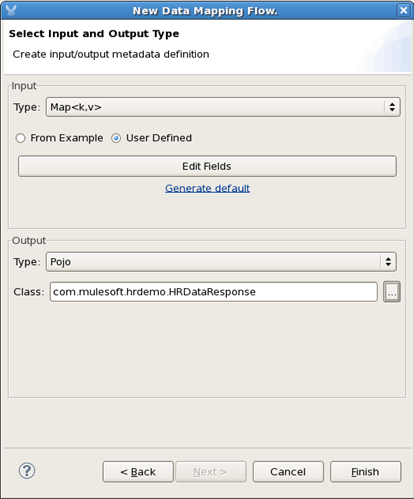 On the Service Class, browse for the Interface called HRDataService (com.mulesoft.hrdemo.HRDataService). 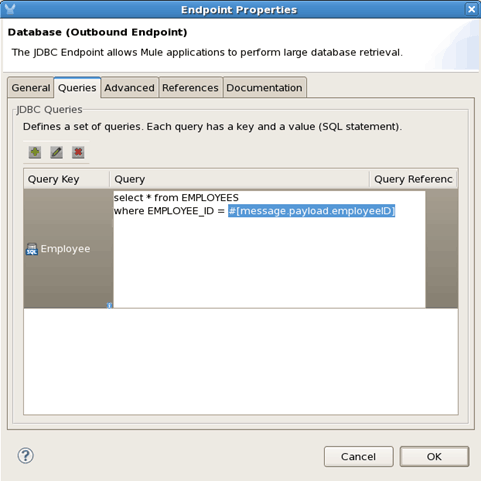 Double click the Get Employee Data database component and in the Queries tab, edit the Query. 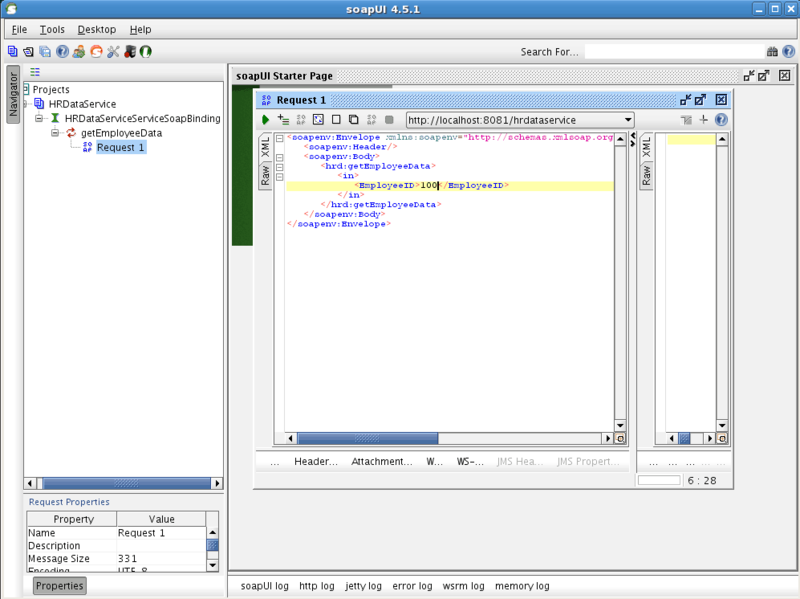 Replace #[message.inboundProperties[’empid’]] with #[message.payload.employeeID]. 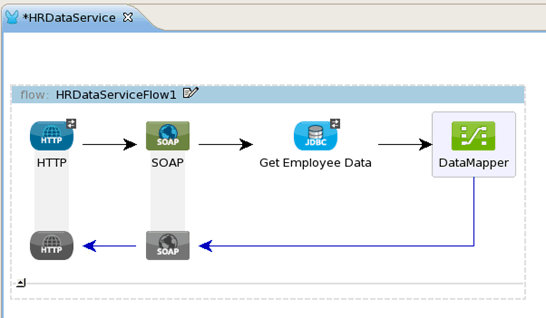 We will now get the employee ID parameter from the SOAP message instead of the HTTP URL. 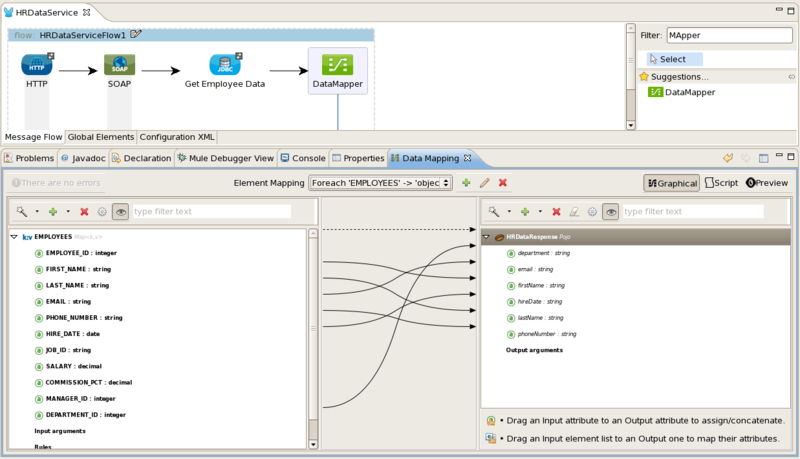 Next, let’s do a transformation using the Data Mapper. 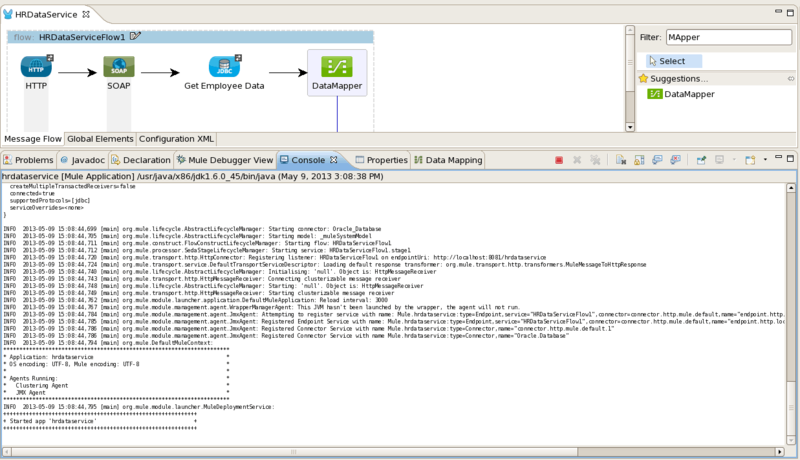 Drag the Data Mapper component to the end of the flow and call it Employee_DB_to_SOAP. 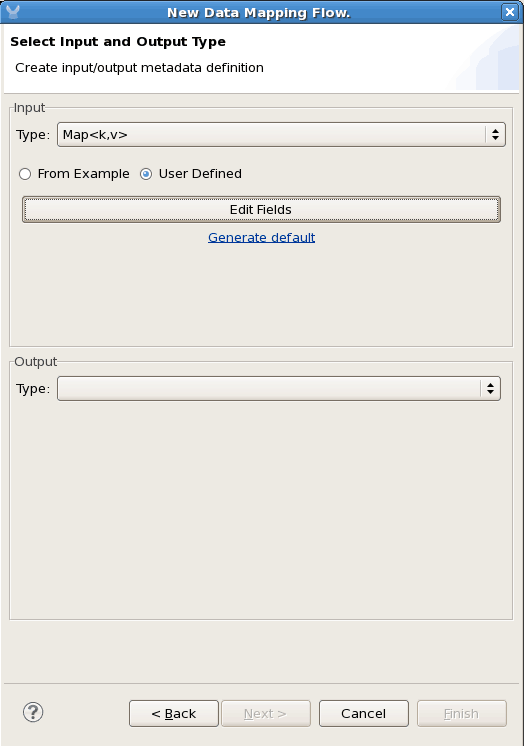 For the Input, specify a Map type and choose User Defined. 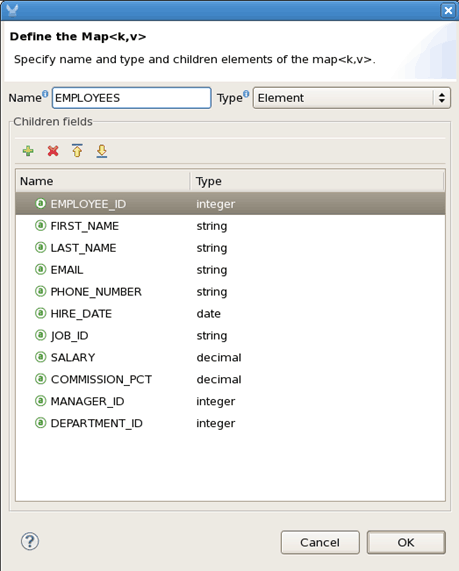 Enter the following fields to match the Employee database table structure. 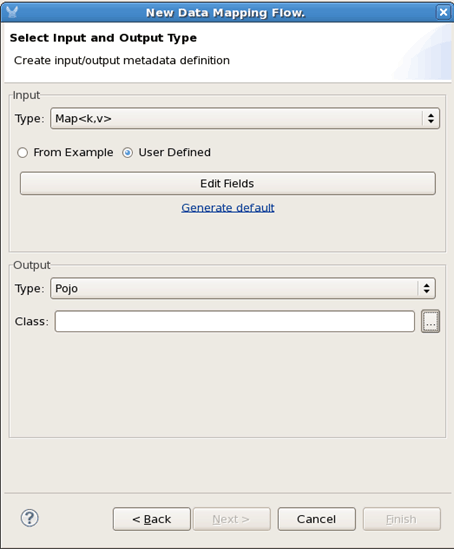 For the output, select POJO and locate the class HRDataResponse. This class was generated from the WSDL. Save your project. The Mule ESB runtime will dynamically pick up the changes and redeploy, which you should see from the Console output. 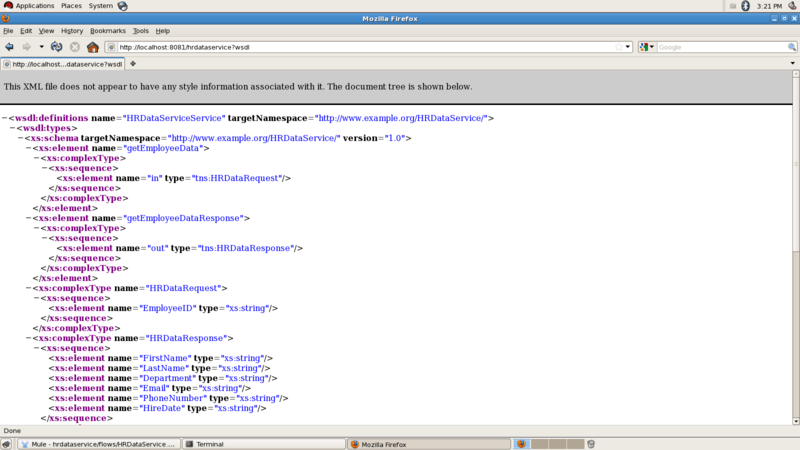 Start a browser and enter the URL: http://localhost:8081/hrdataservice?wsdl to see the WSDL document. 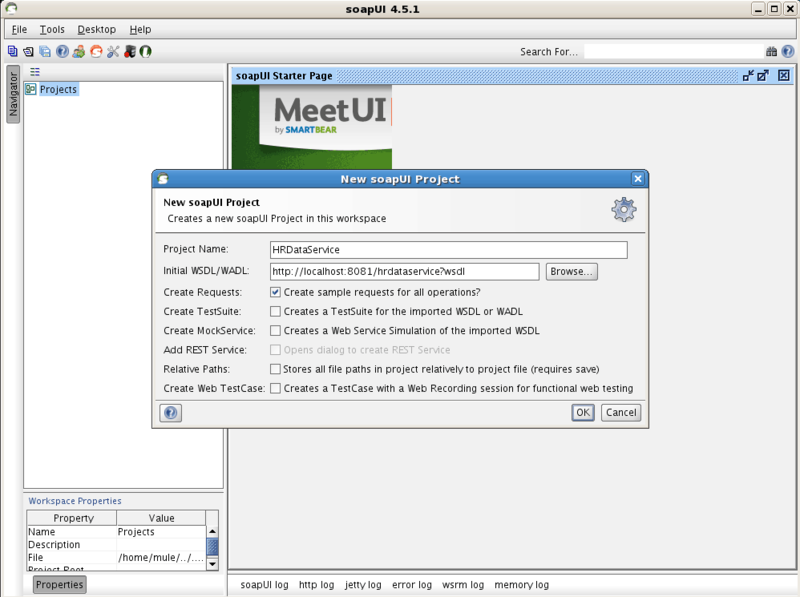 icon to execute the web service. You should see the employee data for Employee 100 (Steven King) in the SOAP response. As you can see, it is very easy to create services with Mule Studio – whether plain HTTP Services with JSON or SOAP-based Web Services. It is very easy as well to transform data to and from heterogeneous data formats like that of a database table structure and XML. In this example, we were able to accomplish these without writing any code by utilizing the SOAP component for top-down web service generation and the Data Mapper for transformations. 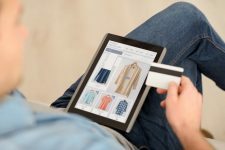 For more on Mule, check out: http://www.mulesoft.com/. Complete Part 1 of this Blog. Many thanks for the post. 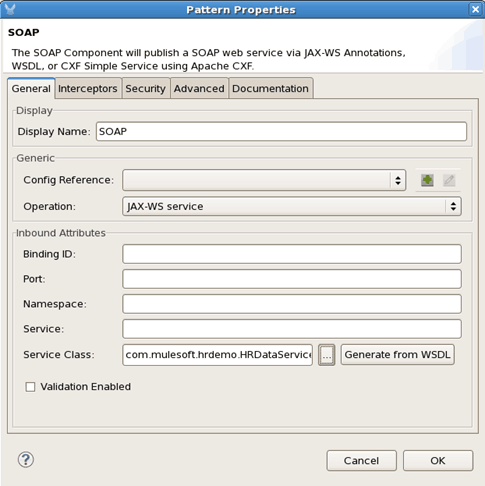 When am trying to load the wsdl file(HRDataService.wsdl) in SOAP Component it showing WSDLException = PARSER_ERROR.Kindly help me out from this issue.